Lara Croft is an English archeologist and the main protagonist in the 2013 series reboot, Tomb Raider. Fresh from academy and in search of lost relics, a 21-year-old Lara Croft journeys to an island off the coast of Japan aboard the Endurance, a salvage vessel helmed by Captain Conrad Roth. Build order : Head,hair,ponytail,neck,necklace,torso,legs,feet, USMC belt, quiver and arrows, holster and belt, rope, walkie talkie, pouches, arms, climbing axe, pistol and finish with the rope. Notes: I suggest you make a lot of pillars for supporting her, i had 10 in each foot, one in each shoe, one large one inside the torso. The height is calculated with the bow on her back, so without the bow she is supposed to be about 20cm shorter, but my build came out a bit shorter and darker, so that's not the model itself, but the printer. 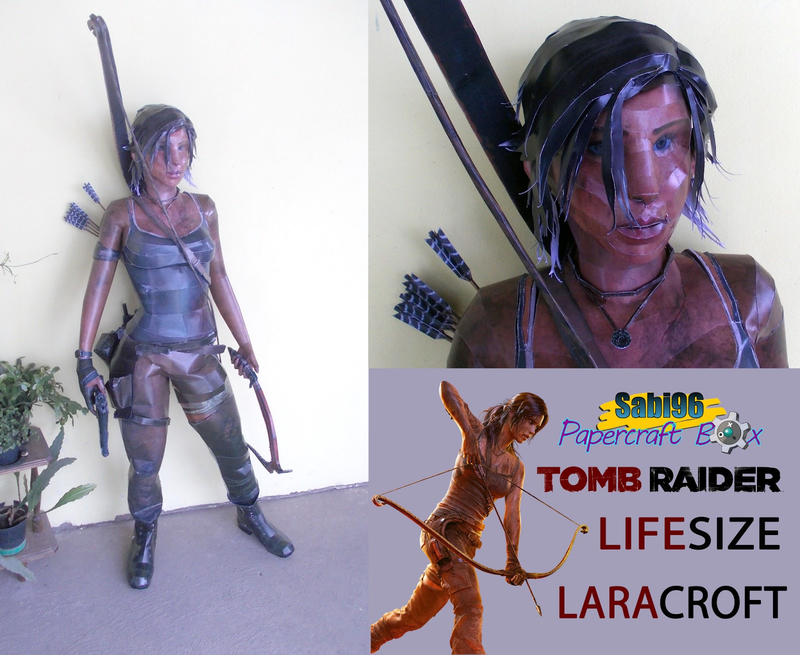 Be careful when gluing the feet and legs together, and gluing the feet in a bad angle results in Lara being unstable. The hair is single sided so you can leave it white, or you could simply print brown or black to the back sides of the sheets, but that is a LOT of ink, so mine is single sided. UPDATE: I've had a few complaints that the template is too dark. I've updated the textures on the pdo, they should be much brighter now. Enjoy!